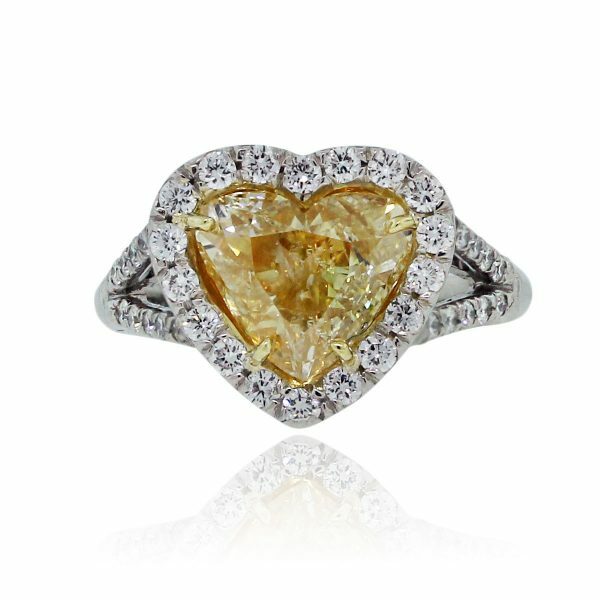 Find this Platinum 2.01ct Fancy Yellow Heart Shaped Diamond Engagement Ring at Raymond Lee Jewelers in Boca Raton — Palm Beach County’s destination for engagement rings, men’s wedding bands, wedding bands for women and diamond rings. Center Diamond Details 2.01ct Fancy Yellow Heart Shaped Diamond. Diamond is VS2 in clarity. Mounting Diamond Details Approximately 0.56ctw of Round Brilliant Diamonds, Diamonds are G/H in color and VS in clarity. Categories: Diamond Engagement Rings, Engagement & Wedding | Raymond Lee Jewelers, Fancy Color Engagement Rings, Heart Shape Engagement Rings. Tags: 18k gold, 18k Yellow Gold, Diamond Engagement Ring, Diamond Ring, fancy yellow, fancy yellow diamond, Heart Shaped Diamond, Platinum, Yellow Gold.